Over the last few years, virtual reality has re-emerged as a technology that is now feasible at low cost via inexpensive cellphone components. In particular, advances of high-resolution micro displays, low-latency orientation trackers, and modern GPUs facilitate extremely immersive experiences. To facilitate comfortable long-term experiences and wide-spread user acceptance, however, the vergence-accommodation conflict inherent to all stereoscopic displays will have to be solved. We present the first factored near-eye display technology supporting high image resolution as well as focus cues: accommodation and retinal blur. To this end, we build on Wheatstone’s original stereoscope but augment it with modern factored light field synthesis via stacked liquid crystal panels. 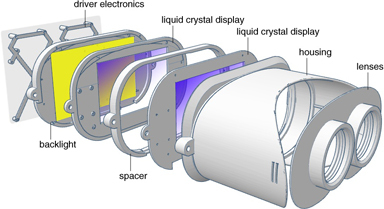 The proposed light field stereoscope is conceptually closely related to emerging factored light field displays, but it has very unique characteristics compared to the television-type displays explored thus far. Foremost, the required field of view is extremely small – just the size of the pupil – which allows for rank-1 factorizations to produce correct or nearly-correct focus cues. We analyze distortions of the lenses in the near-eye 4D light fields and correct them using the high-dimensional image formation afforded by our display. We demonstrate significant improvements in resolution and retinal blur quality over previously-proposed near-eye displays. Finally, we analyze diffraction limits of these types of displays along with fundamental resolution limits.